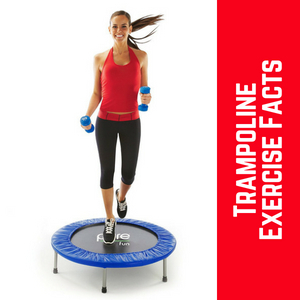 21 Fascinating Facts About Trampolines - Exercise, Education, and More! A lot of our articles assume that our readers are pretty familiar with trampolines – after all, this is a website called “Trampoline Review Guide.” But we’re not just here to help people who are already committed to buying a trampoline. 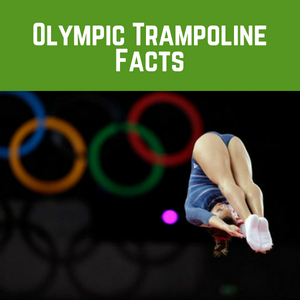 We want to help newcomers understand why they might want to get into this great hobby we love, and that’s why today we’ve compiled this list of some of the most interesting and important trampoline facts. Think of this as a “beginner’s guide” to trampoline facts, designed to help you understand why people buy trampolines, what makes trampolines interesting, and maybe just teach you something you didn’t know about this backyard hobby. As we go through the list, we’ll also link to other articles of ours where you can learn more about a specific topic, like where to buy the best trampolines for sale in 2018. If there’s anything you want to know more about by the end of the article, be sure to let us know in the comments so we can be sure to get it added. 1.1 1. The highest trampoline bounce ever recorded launched a man 22 feet in the air. 1.2 2. The world’s largest trampoline is actually several trampolines connected together. 1.3 3. The inventor of the trampoline showed off his invention with a kangaroo. 1.4 4. He also went trampolining on top of a pyramid. 1.5 5. The record for most trampoline backflips in a single minute is 49. 1.6 6. Bill Gates has a trampoline room in his house. 2.1 1. Statistically, trampolines are safer than you think. 2.2 2. Trampolines aren’t the problem. 2.3 3. Most injuries happen when there are multiple people jumping at the same time. 2.4 4. Springless trampolines are a thing. 2.5 5. You should buy a trampoline with a safety net. 3.1 1. NASA says trampolining is better than jogging. 3.2 2. Trampolines improve your motor skills. 3.3 3. Trampolines improve coordination and balance. 3.4 4. Trampolines improve your core strength. 3.5 5. Rebounder trampolines are especially good for exercise. 4.1 1. The inventor of the trampoline always wanted it to become an Olympic event. 4.2 2. Trampolinists always wear special footwear while trampolining. 4.3 3. Olympic trampoline scoring is based on three factors. 4.4 4. There are synchronized and individual trampoline events. 4.5 5. The USA is really good at the trampoline event. 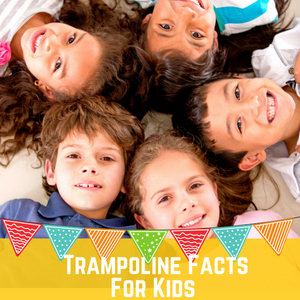 Nobody loves trampolines more than kids, so let’s get started with some of the weirdest and funniest trampoline facts that the young and young-at-heart will find interesting. 1. The highest trampoline bounce ever recorded launched a man 22 feet in the air. The bounciest trampoline in the world was built by three brothers – Sean, Eric, and T.J. Kennedy – who hold the Guiness World record for highest trampoline bounce. 2. The world’s largest trampoline is actually several trampolines connected together. It’s called Flip Out, it’s located in Glasgow, and it’s a single continuous jumping surface of 63,000 square feet in size. 3. The inventor of the trampoline showed off his invention with a kangaroo. George Nissen and Larry Griswold built the very first trampoline in 1936. To market his new exercise product, Nissen rented a kangaroo to jump on the trampoline along with himself in the middle of Central Park. 4. He also went trampolining on top of a pyramid. Look – George Nissen was a weird dude. In 1977, he sponsored a group of American athletes on a trip to Egypt. He claimed the trip was just a chance to market his invention in a new country, but it was actually a ruse so that he and his son-in-law could go climbing on top of a flat-topped pyramid and do some trampolining. 5. The record for most trampoline backflips in a single minute is 49. This recent record was set in 2017 by Lucas Laurent, who did almost one flip per second. 6. Bill Gates has a trampoline room in his house. It’s part of his 2,500 square foot exercise facilities, which also include a sauna, a steam room, and two locker rooms. No word on what kind of trampoline he uses, but as a man of taste he probably likes the same model of trampolines that we do. 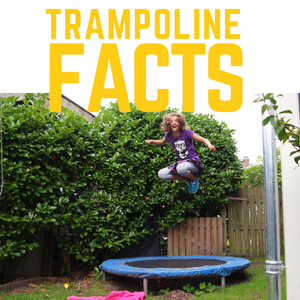 Trampolines are a lot safer than you might think, as the following trampoline facts will show you. If you want to learn more about how to use a trampoline safely, we have a complete guide on the subject which you can read here. 1. Statistically, trampolines are safer than you think. You may have heard that trampolines are responsible for 100,000 injuries each year, but that’s simply not true – a UK study found that the actual number is closer to 288 on average. Most of these injuries are sprains or cuts, and the most serious injuries were merely fractures – anything as serious as a broken bone is extremely uncommon. 2. Trampolines aren’t the problem. 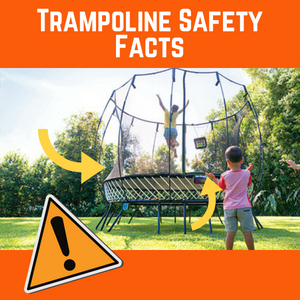 The vast majority of trampoline injuries are caused by inattentive parents or because people fail to assemble safety nets properly, if at all. Trampolines are being made with more high-tech safety features than ever, but people still need to take personal responsibility for their own safety and for the safety of their children. 3. Most injuries happen when there are multiple people jumping at the same time. Falling, getting caught in the springs – these can all cause pain and should all be avoided. But more than two-thirds of trampoline injuries occur because there are multiple people jumping on a trampoline that shouldn’t hold more than one person. So please – be polite and wait your turn! 4. Springless trampolines are a thing. Many trampoline companies are making trampolines that use thick, taught cable instead of springs. These give you a worse bounce than their springed alternatives, but they’re a lot safer because little ones can’t get their fingers stuck and the cables are less likely to snap or react unexpectedly. Springfree is a trampoline company that’s known for making springless trampolines and for taking extra safety precautions with their products. 5. You should buy a trampoline with a safety net. An enclosed trampoline will make it more difficult for you or your children to jump off the trampoline, fall, and hurt something. Trampolines are a lot of fun to just bounce on, but they also have tangible exercise benefits that make them a must for any home. Here’s some trampoline facts about exercise you might not be aware of, and if you want to read about the 8 best trampoline workout routines available, try this article. 1. NASA says trampolining is better than jogging. According to their findings, 10 minutes on a trampoline burns as many calories as a 30-minute jog without putting stress on your ligaments or your joints. 2. Trampolines improve your motor skills. A lot of exercise works out only one part or one area of your body, which is why you have “leg day”, “arm day”, etc. Trampolining involves your entire body working in unison as you bounce, which can greatly improve your motor skills. This is why trampolining is especially recommended for children and is often used for pediatric physical therapy. 3. Trampolines improve coordination and balance. I mean, this one’s just obvious, right? Jumping shifts your center of gravity and requires you to coordinate your landing carefully so that you don’t lose your balance, making it a great way to improve your range of motion and your balance in everyday life. 4. Trampolines improve your core strength. According to the Center for Disease Control and Prevention, trampolining provides many of the same benefits as gymnastics, yoga, and calisthenics. 5. Rebounder trampolines are especially good for exercise. Rebounder trampolines can be used with or without weights for an excellent full-body workout that’s great for all age groups. You can learn more by reading our complete rebounder workout guide. 1. The inventor of the trampoline always wanted it to become an Olympic event. Goold old George Nissen – Mister Kangaroo himself – was one of the leading champions of trampolining as an Olympic sport, even after he was no longer making and selling the product. When his dream finally came true in 2000, he attended the event with his daughter Dian, the International Ambassador for Trampolines and a former world champion in her own right. 2. Trampolinists always wear special footwear while trampolining. Professional trampolinists never bounce barefoot – they wear special socks or jump shoes to avoid rugburn. 3. Olympic trampoline scoring is based on three factors. 4. There are synchronized and individual trampoline events. Just like there are for other types of gymnastic routines. The “synchronized” event was introduced into the world championships in 1966 and has been part of the Olympic event since 2000. 5. The USA is really good at the trampoline event. Judy Wills Cline has won more world championships than any other competitor and was the first female trampolining world champion. She also became half of the world’s first world champion synchronized team along with Nancy Smith. On the mens’ side, the first world syncro winners were Americans David Jacobs and Wayne Miller and Dan Millman was the first male world champion. However, Chinese gymnast Dong Dong has dominated in more recent years, winning the gold medal in 2008, 2012, and 2016.